From a Dutch oven to an elegant vase, you’re bound to find something both wonderful and affordable to gift to your friends and family this season, and still manage to stay green! In my opinion, Cast Iron is an indispensable item. 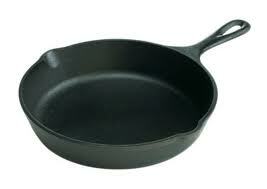 Cast Iron skillets last forever and have superior quality and durability, plus they are much healthier to cook from. This 8 inch skillet from Lodge Cast Iron is only $16.95. This would make a great gift for any cook, from the sophisticated food snob to the woodsy outdoorsman or woman. 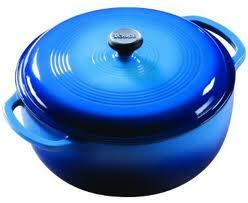 Now if you’d like that style and elegance in the kitchen, add a touch of beauty by going for an enamel Dutch oven. So, not feeling the ‘Irony’… Let’s take a look at glass. 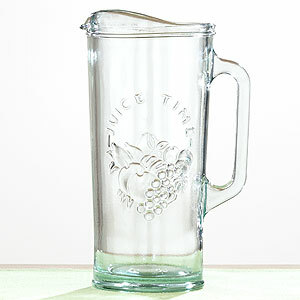 This juice pitcher is made from recycled glass, durable for everyday use and elegant enough for those special occasions… you can get this one from Cost Plus for only $12.99. Thrift stores are full of glass and it’s worth it to take a look and see what you can find for even less expensive than that! Giving glass is great because it doesn’t age! If you buy a stellar used glass item, or find one in an antique store you can wash it up in hot sudsy water to clean, wrap it up in festive tissue, place it in a recyclable box or bag, slap a bow on it and call it a day! Feel proud, real proud! You are helping save the planet! I love cast iron, although sometimes it can be a little heavy. Thanks so much for the information, I enjoyed reading!